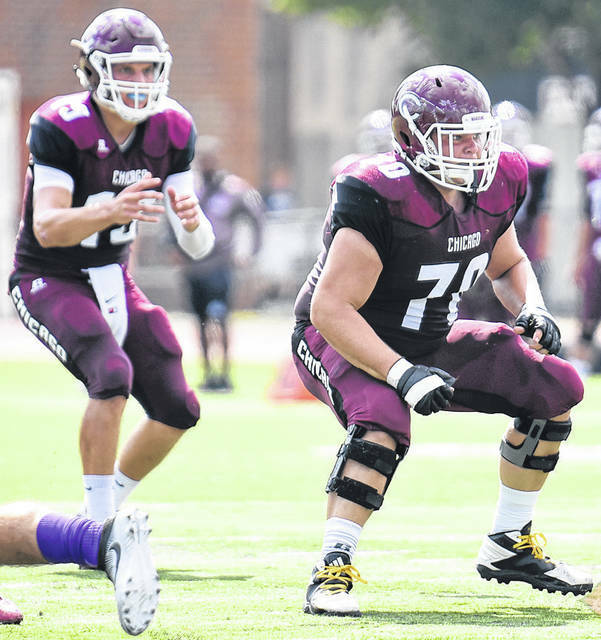 Owen Moore (70) prepares to pass block during the Maroon’s 35-16 victory over Millsaps on Sept. 17, 2016, in Chicago, Ill.
CHICAGO, Ill. — Surviving the Windy City is one thing, thriving there is a whole different ball game. Owen Moore — a 2014 Gallia Academy High School graduate — recently graduated from the University of Chicago with a degree in Public Policy Studies, after playing four years of football for the Maroons. Chicago — one of the top academic universities in the nation — is an NCAA Division III school, that competes in the University Athletic Association. While with the Maroons, Moore was coached by Chris Wilkerson, who has a 30-19 record in five seasons with the program. On the gridiron, Moore was a four-year varsity letter winner, competing in 37 games on the offensive line. Moore helped to pave the way for the school’s second all-time leading rusher, Chandler Carroll, while also blocking for the program’s second all-time leading passer, Burke Moser. Owen’s college career started out with a bang, as he played in all-9 games in his freshman season, helping UC to an 8-1 record and a UAA Championship. The Maroons went 6-4 in 2015, with Moore playing all-10 games on the offensive line. Moore missed a game in each his junior and senior seasons, helping Chicago win four games in 2016 and six games in 2017. In Moore’s four seasons, Chicago had a combined league record of 18-9, winning at least 50 percent of its league games each fall. Moore was a member of the University Athletic Association All-Academic team three years. As a senior he was selected to the National Football Foundation Hampshire Honor Society. Moore noted that the road trips, such as a visiting historical landmarks in San Antonio, Texas, prior to a game at Trinity College, as some of the best memories to go along with his football career. Moore completed his degree a quarter early, graduating from the university with honors in March. Currently, Moore is interning at a lower-middle market investment bank in Chicago, and is hoping to stay on as analyst. Moore may have found a new place to call home, but has not forgotten the people who have helped him along the way. “I just want to thank my family for being so supportive and really paving the way for me to accomplish everything that I have,” Moore said. “I also want to thank everybody back home in the Gallipolis and Gallia County greater community that has always supported me.